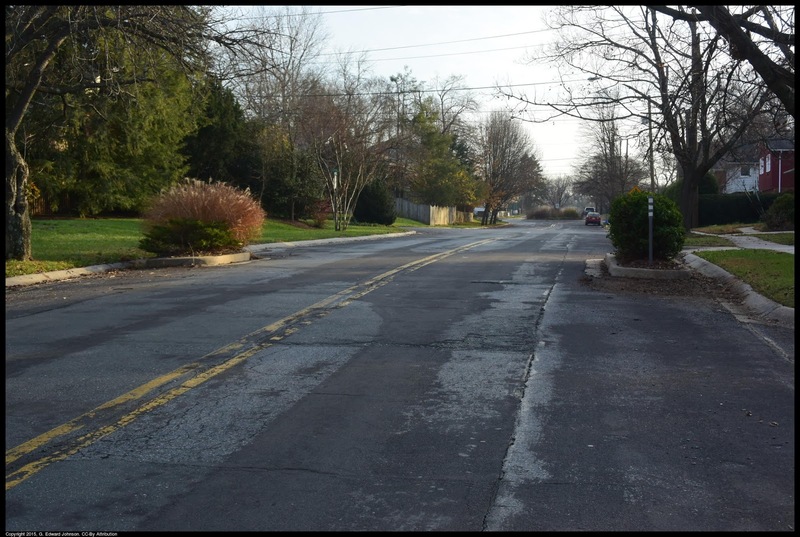 I was recently involved in a discussion about how to make traffic go slower on neighborhood streets. The main options people put forward were 1) speed bumps, and 2) speed cameras. I'm not a big fan of either, speed bumps can do damage to your suspension and it makes it harder for emergency vehicles to get around. Montgomery County also has limits on where and when speed cameras can operate. 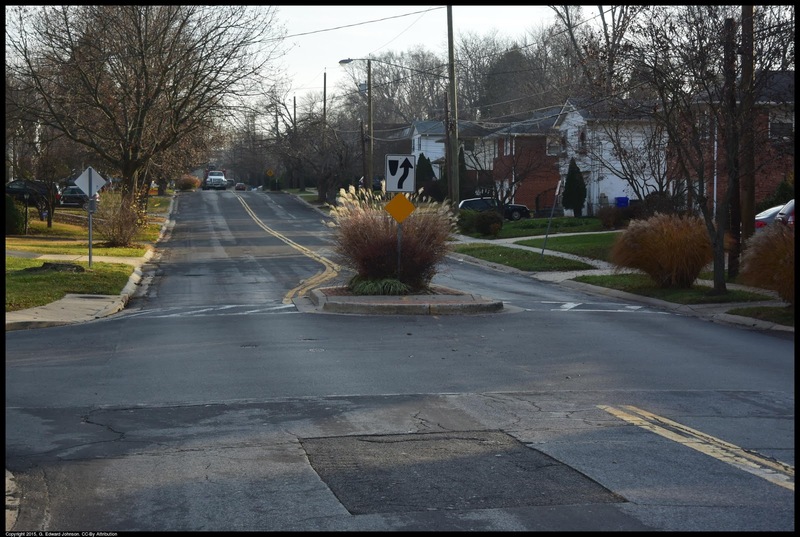 It struck me that most people, me included, don't know what the options are for traffic calming and knowing the options might help people decide which ones are most appropriate for a given situation. There are several general classes, including laws (speed limits), signage, and physical modifications to the road. 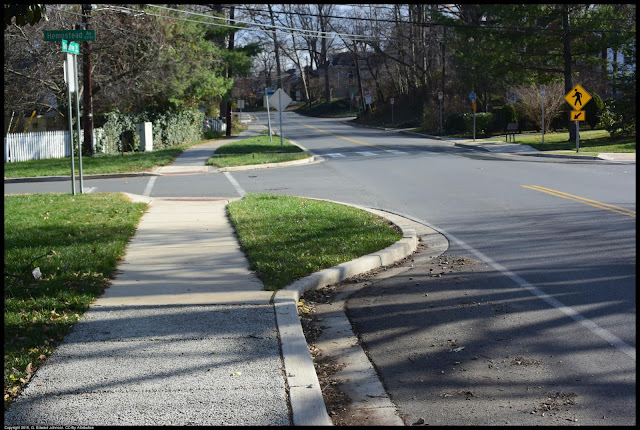 I decided to look around Bethesda and start inventorying different physical traffic calming structures I found. Concrete islands are placed on the sides of the road to artificially narrow Ewig Drive near Fernwood Road. 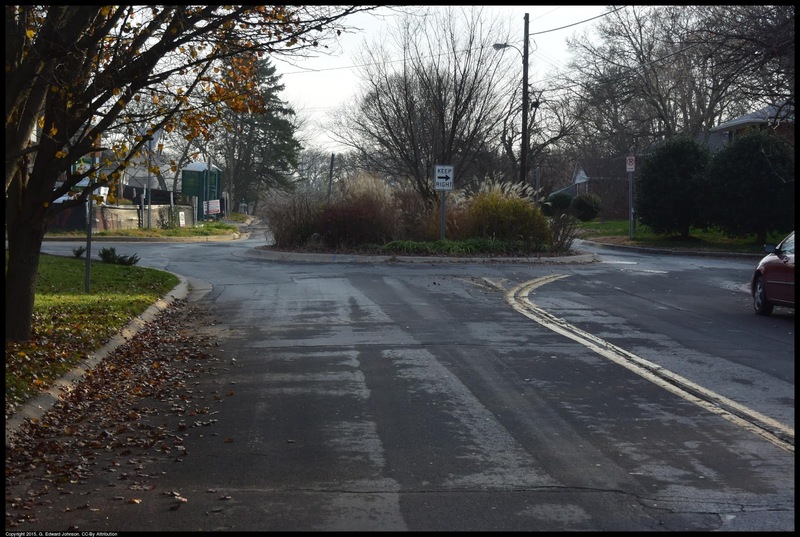 Cars have to slow down to go around the traffic circle. This reduces speeds without making people come to a complete stop at an intersection like a stop sign would. Traffic circles are generally used at intersections. This one is on Ewig Drive near Greentree Road. Not only does a pedestrian refuge slow traffic down by constricting the road, it also provides a safe place for a pedestrian to stand if traffic is heavy and they can't make it all the way across the street. I think this one is flawed because cars coming towards the camera can't see if someone is standing in the refuge because of how large the plants are. This one is on Ewig Drive near Greentree Road. One of the many ways the county tries to slow traffic down is by artificially making the street narrow in places. This bump in is at the corner of Greentree and Hempstead. 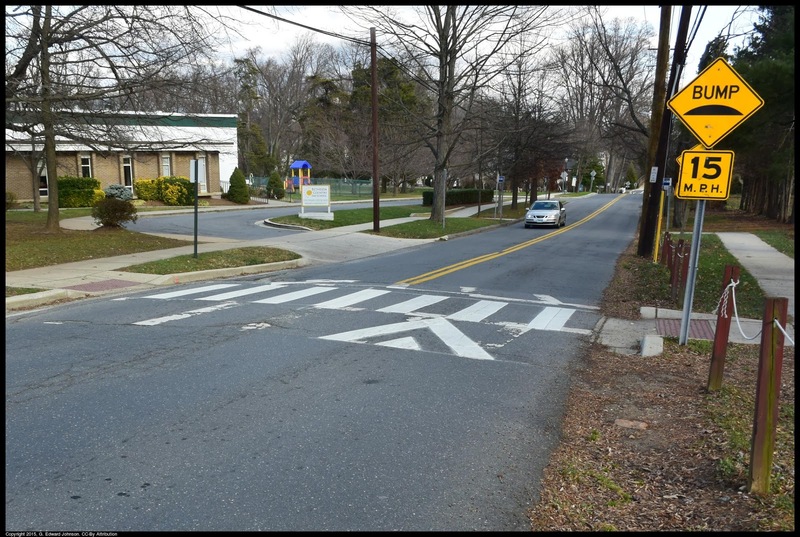 A raised crosswalk is bit like a speed bump but much longer. It makes crosswalks stand out a bit more to cars. This is on Beech Avenue near the YMCA. If you know of any others, let me know in the comments. Include a street name if possible so people can see for themselves how they work.